Let Rioja buy you dinner! Rioja wines are the best food pairing wines in the world. Vibrant Rioja will prove it by taking you and a friend to one of the best restaurants in your area. Back in the 1970s, when I was a young fella who hadn't started writing about wine and really didn't even know all that much about it except that it was good, the New York Times food writer Craig Claiborne belted out a hymn of praise to a "little" French wine called La Vieille Ferme, "the Old Farm." Pay no attention to the fact that this wine came from the Côtes-du-Rhône, Claiborne advised, even though in that day if French wine didn't come from Bordeaux or Burgundy it didn't win much respect. It must have sold for around $2.50, a pretty good price in the day when $5 bought very good wine and the $6 point was for celebrations and holidays. Then as now, La Vieille Ferme was made from Southern Rhône grapes selected and bottled by the Perrin family, owners of noteworthy Rhône properties including the iconic Chateau de Beaucastel Chateauneuf-du-Pape. And over the years it hasn't changed much. When Côtes-du-Rhône finally started to earn the respect it deserved and prices went up, the Perrins moved around the corner and down the road to the Côtes du Ventoux in Provence. In recent years they've also changed the label from a drawing of, well, an old farm, to one of poultry on the hoof, so to speak, in the barnyard. Neither of these changes much altered what's in the bottle; and a recent shift from natural cork to sturdy metal screwcap is a clear positive in a wine at this price. I liked it then. I like it now. The 2008 is drinking nicely, and the 2009 should start turning up in your local wine shop soon. My tasting resport is below. Rioja wines are the best food pairing wines in the world. The home of the amazing Tempranillo grape will prove it by taking you and a friend to one of the best restaurants in your area. All you have to do is submit a recipe you think will go well with Rioja wines. We'll pick three winners and publish the best ones in our monthly e-newsletter that goes to nearly 70,000 people. Just submit your recipe to RecipeContest@vibrantrioja.com and join our wine community at the same time. Just click here to get started. FOOD MATCH: Made for red meat, it was a natural match with a locavore grass-fed rib eye from a farmers' market, crusted with black pepper, pan-seared and oven-finished with garlic and fresh rosemary. VALUE: As it was in the '70s, so it is now: La Vieille Ferme is hard to beat for value in a traditional Rhône red. U.S. prices, per Wine-Searcher.com, range from $6.50 to $9.99. It's a buy even at my high-end local price; if you can find it for $7 or less it's an insane bargain. 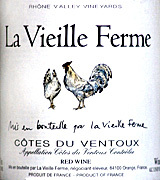 Compare prices and find vendors for La Vieille Ferme on Wine-Searcher.com. The importer also offers a fill-in form you can use to get information on retailers near you. Click here to unsubscribe from future mailings. We're sorry you must leave us, though. If you have a comment or suggestion, please feel free to contact Robin Garr at wine@wineloverspage.com.